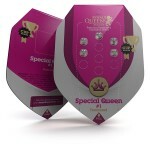 Special Queen feminized will yield about 50g per plant, or 500g per square metre under a 600W light. Outdoors, this plant will grow big and strong and can yield over 550 g per plant. Care should be given to provide it with all the nutrients and water it will need to grow big and strong, while making sure not to give it too much.